Engineers at Rutgers University-New Brunswick report the creation of flexible, lightweight materials with 4D printing that could lead to small implantable biomedical devices, among other applications. Their study (“4D Printing Reconfigurable, Deployable and Mechanically Tunable Metamaterials”) appears in Materials Horizons. “Exotic properties of mechanical metamaterials emerge from the topology of micro-structural elements. Once manufactured, however, metamaterials have fixed properties without the ability to adapt and adjust. Here we present geometrically reconfigurable, functionally deployable, and mechanically tunable lightweight metamaterials created through 4D printing. 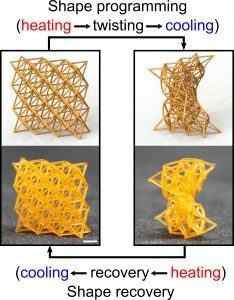 Using digital micro 3D printing with a shape memory polymer, dramatic and reversible changes in stiffness, geometry, and functions of metamaterials are achieved,” the investigators wrote. 3D printing, also known as additive manufacturing, turns digital blueprints to physical objects by building them layer by layer. 4D printing is based on this technology, with one big difference: it uses special materials and sophisticated designs to print objects that change shape with environmental conditions such as temperature acting as a trigger, said senior author Howon Lee, PhD, an assistant professor in the department of mechanical and aerospace engineering. Time is the fourth dimension that allows them to morph into a new shape. “We believe this unprecedented interplay of materials science, mechanics and 3D printing will create a new pathway to a wide range of exciting applications that will improve technology, health, safety, and quality of life,” Lee said. The engineers created a new class of “metamaterials,” materials engineered to have unusual and counterintuitive properties that are not found in nature. The stiffness can be adjusted more than 100-fold in temperatures between room temperature (73°F) and 194°F, allowing great control of shock absorption. The materials can be reshaped for a wide variety of purposes. They can be temporarily transformed into any deformed shape and then returned to their original shape on demand when heated. Tiny devices inserted or implanted in people for diagnosis or treatment could be temporarily made soft and flexible for minimally invasive and less painful insertion into the body, Lee said. Previous articleCould Crocus Sativus (Saffron) Be as Effective as Stimulant Medicines in Treating ADHD?